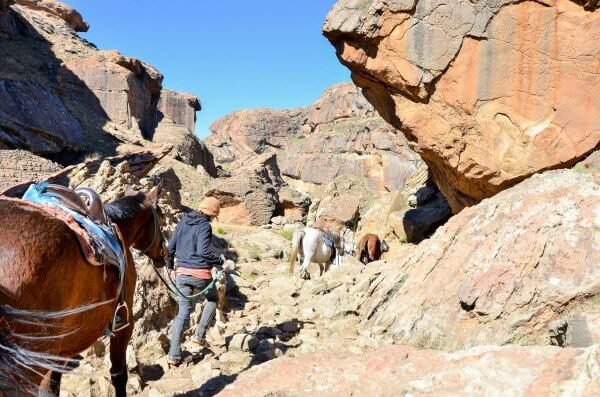 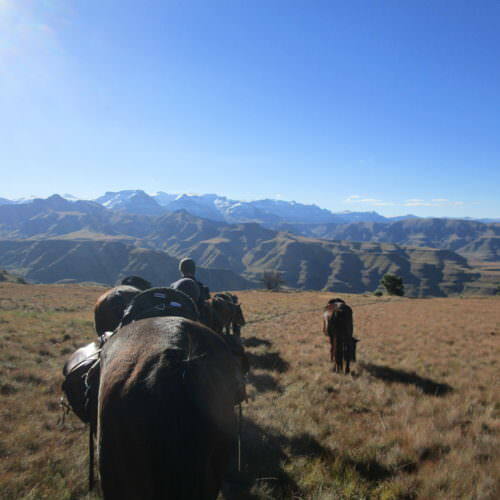 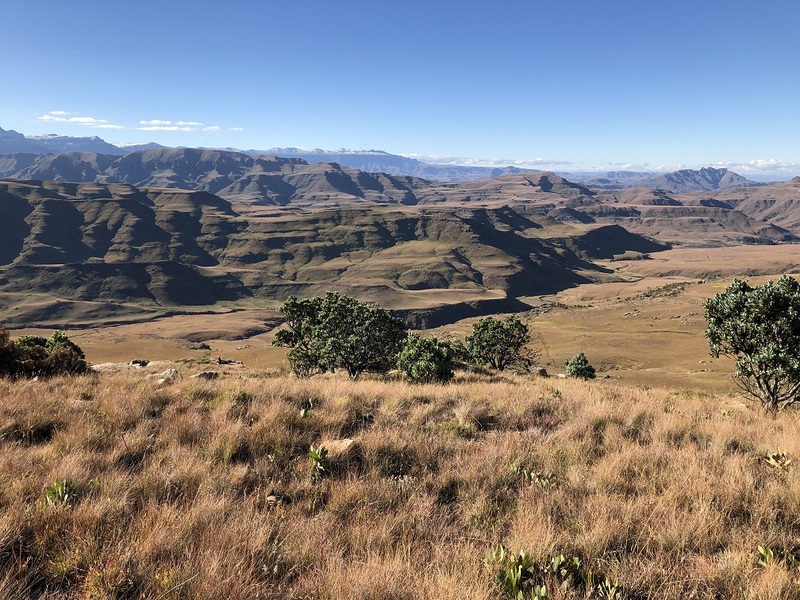 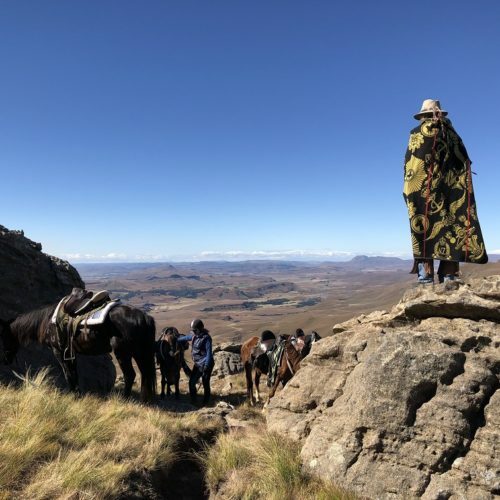 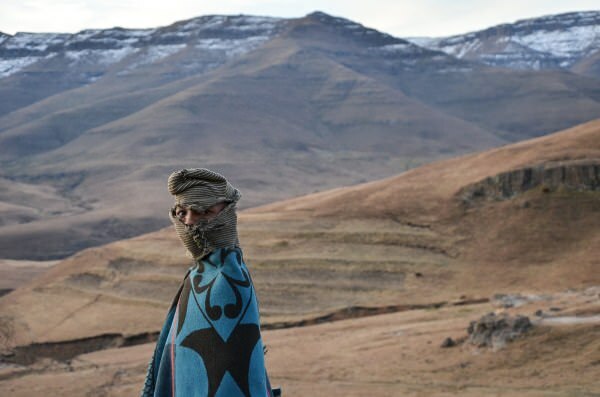 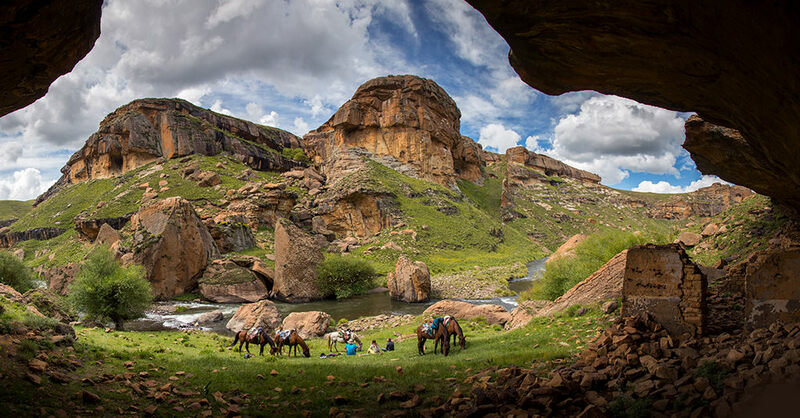 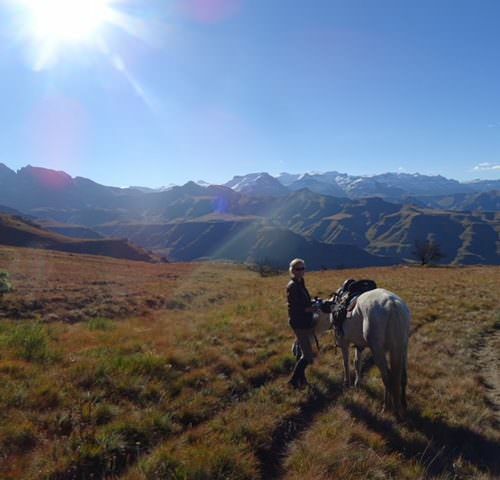 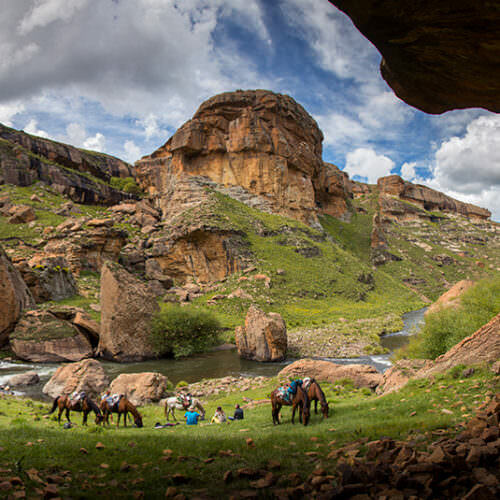 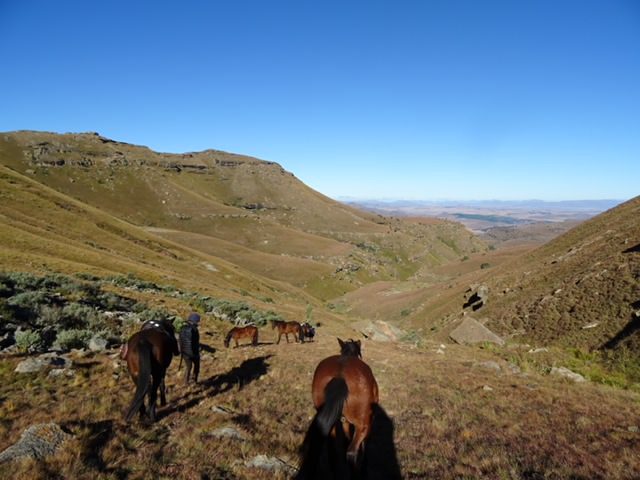 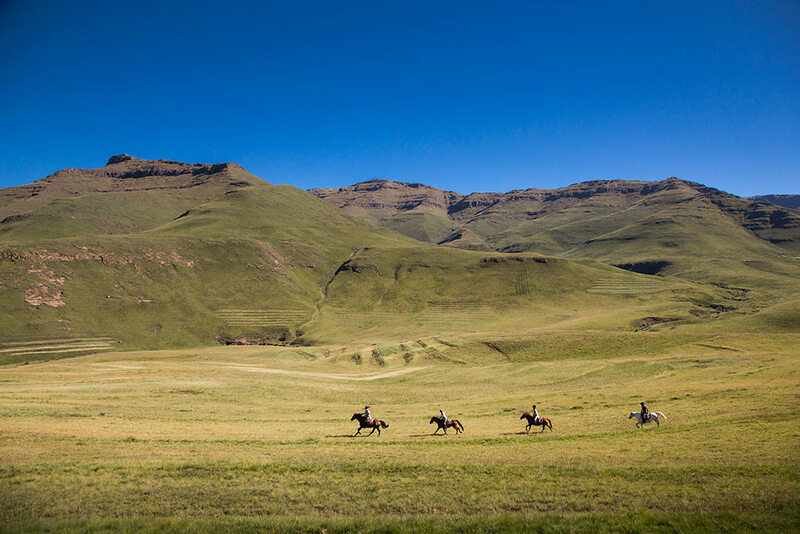 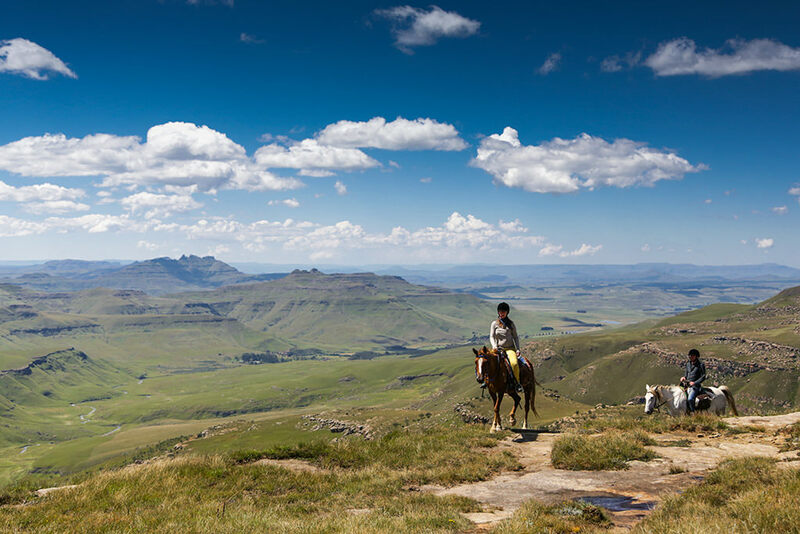 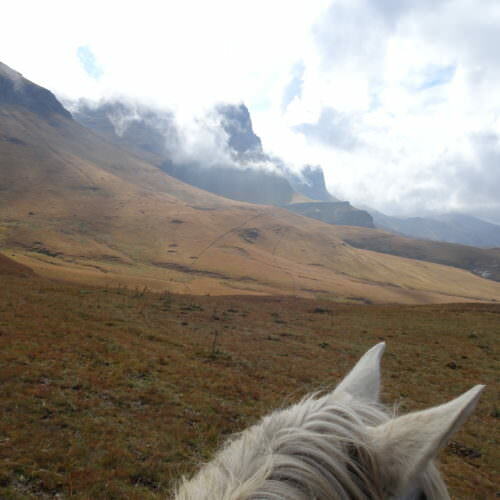 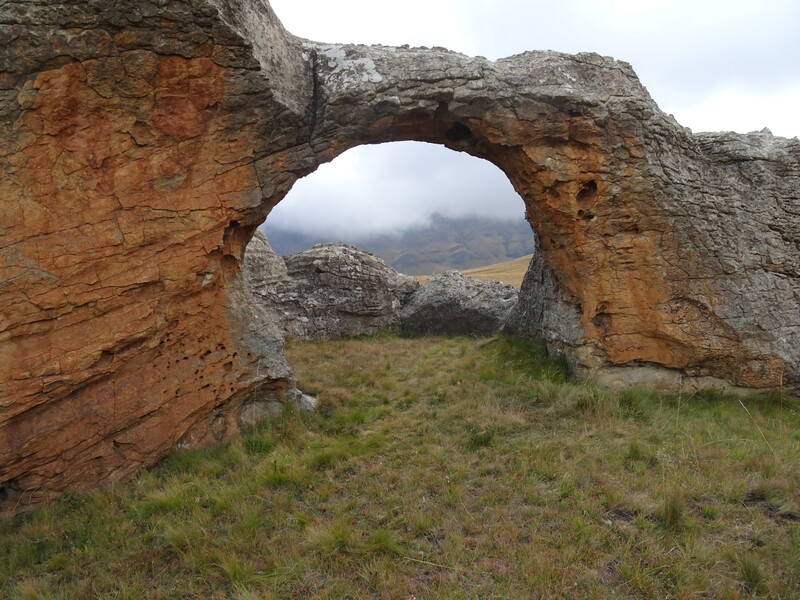 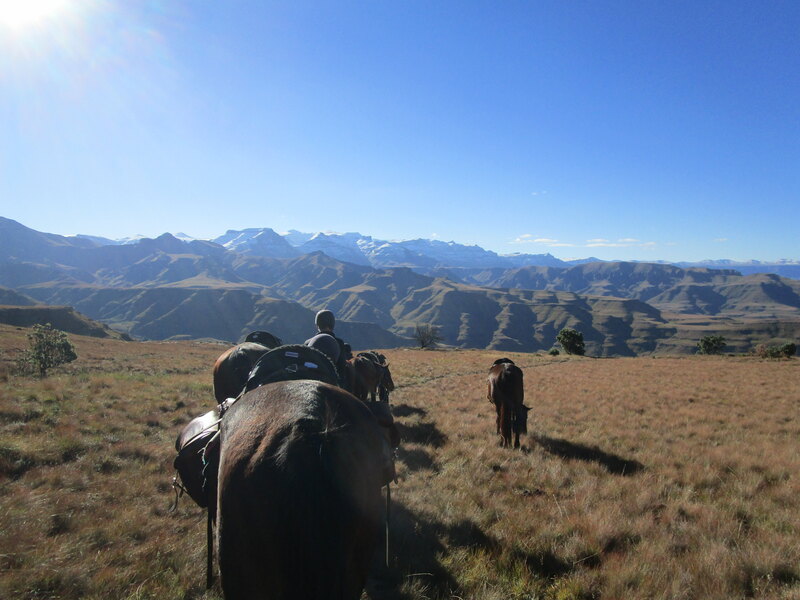 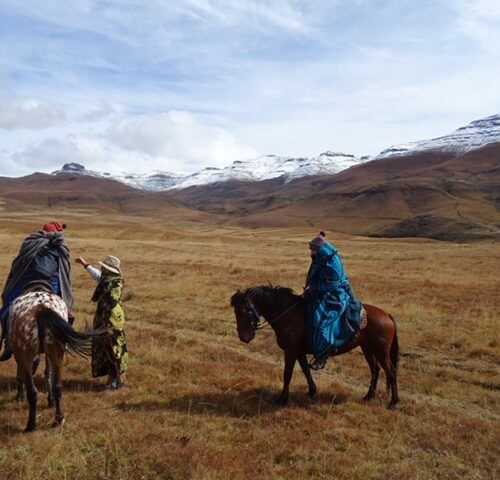 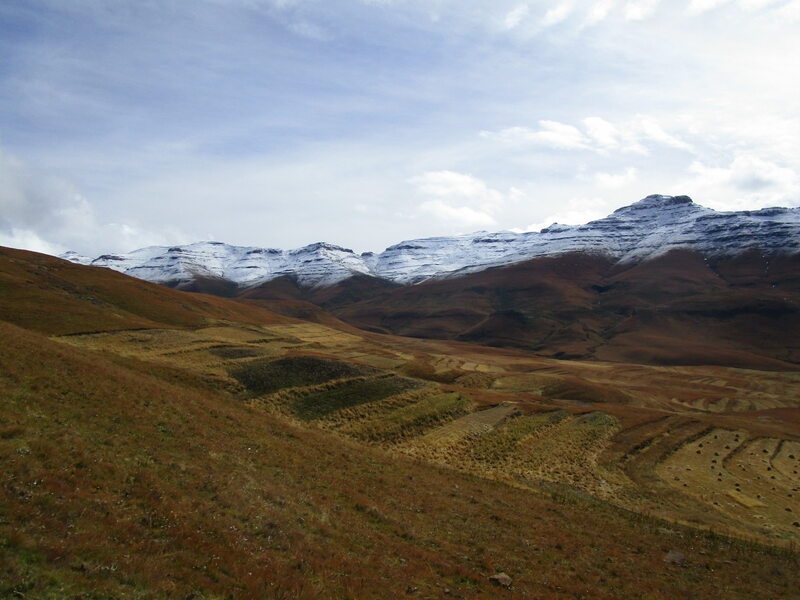 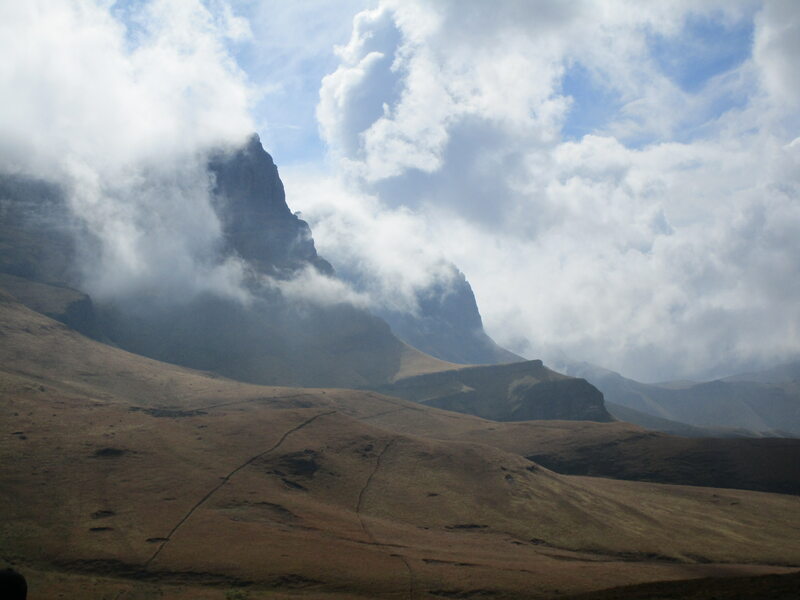 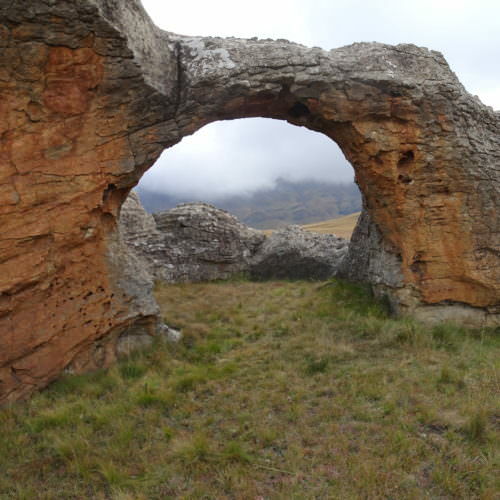 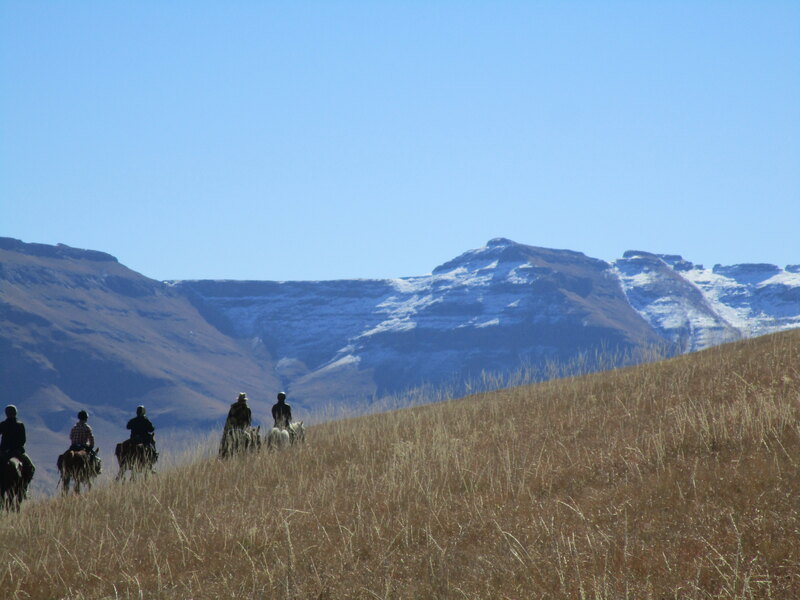 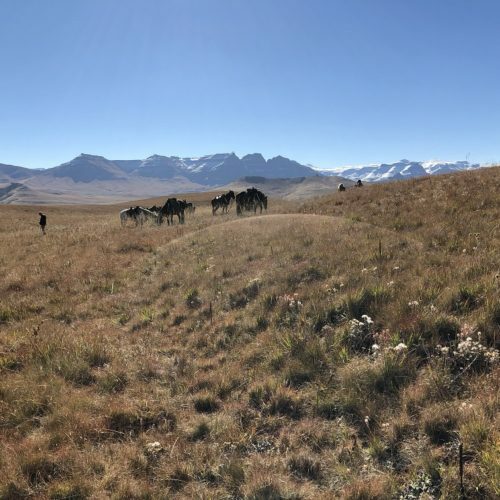 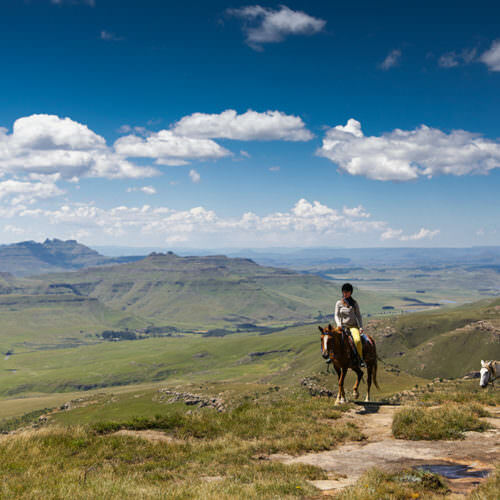 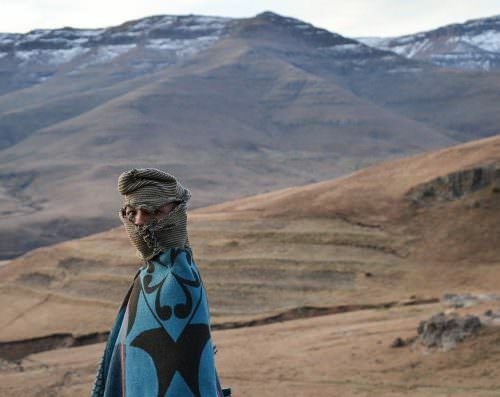 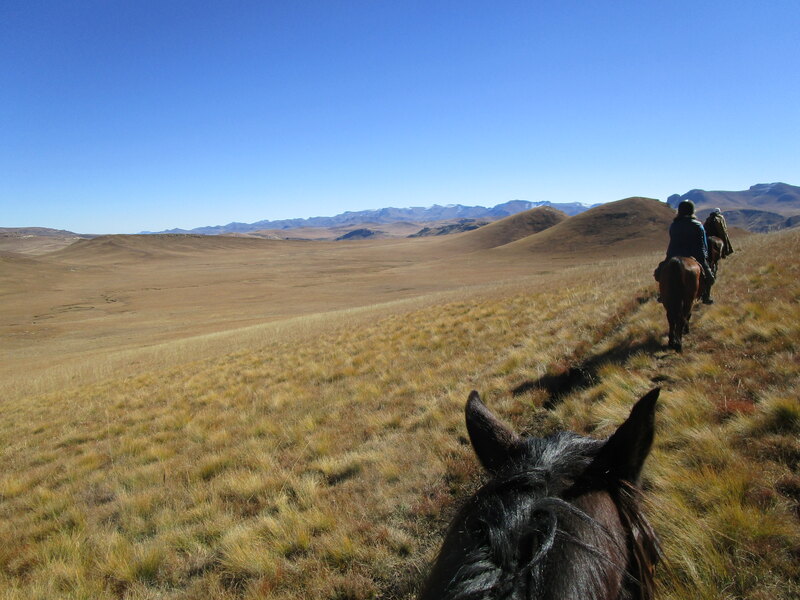 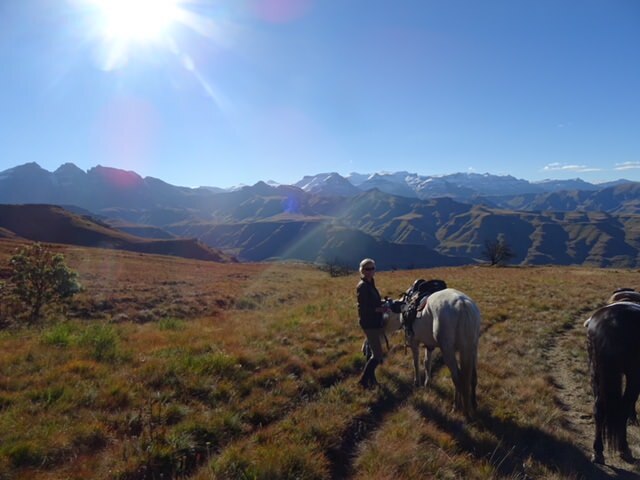 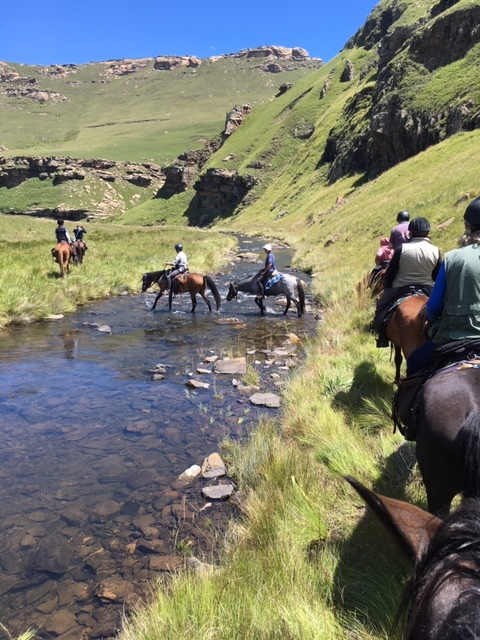 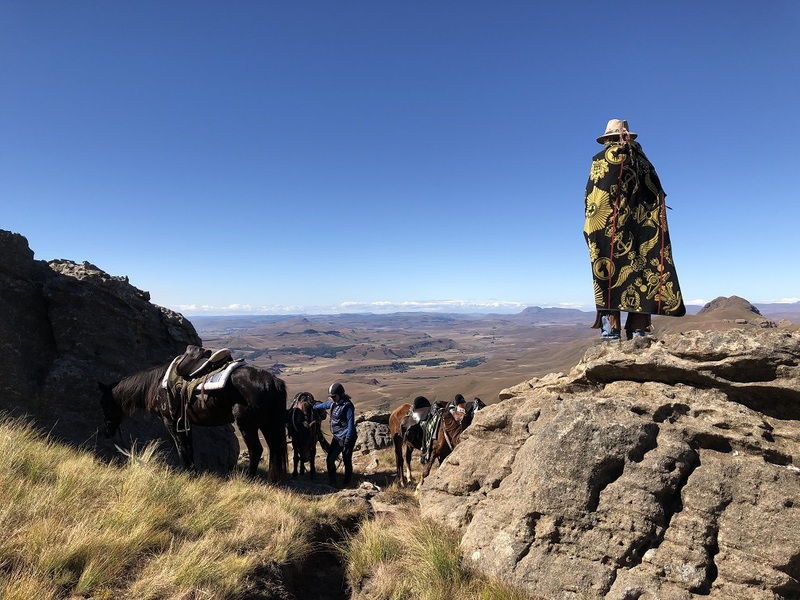 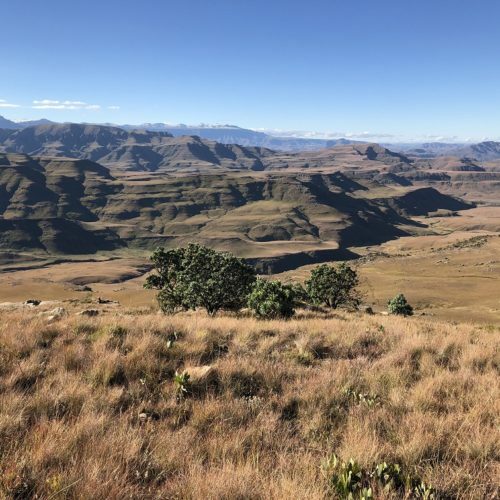 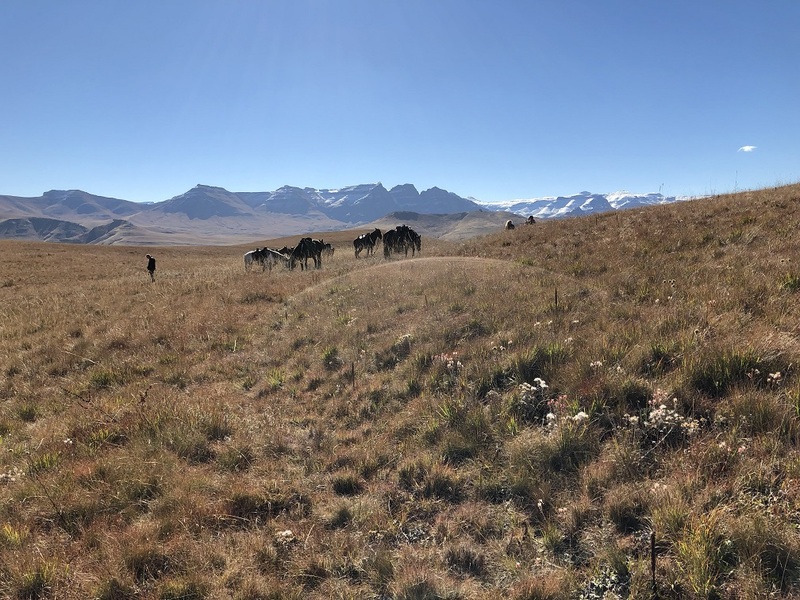 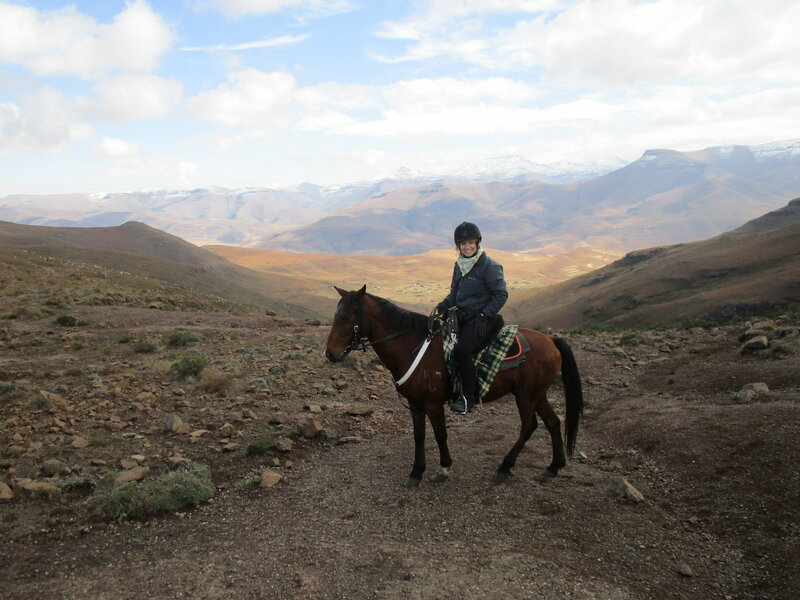 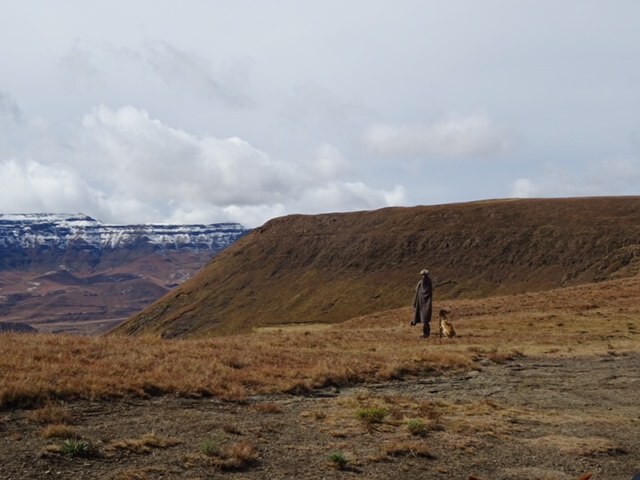 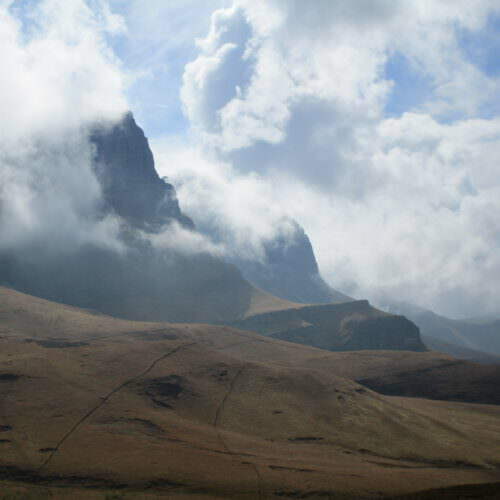 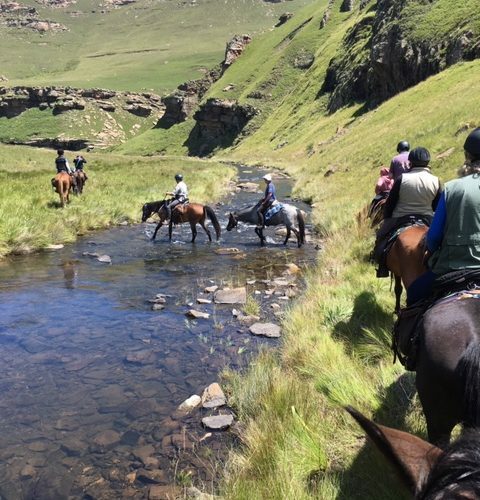 From Khotso in South Africa near the eastern border of Lesotho, the trail ride climbs up to 3,000m through Bushman’s Nek pass into the heart of the Maloti-Drakensberg World Heritage Site. 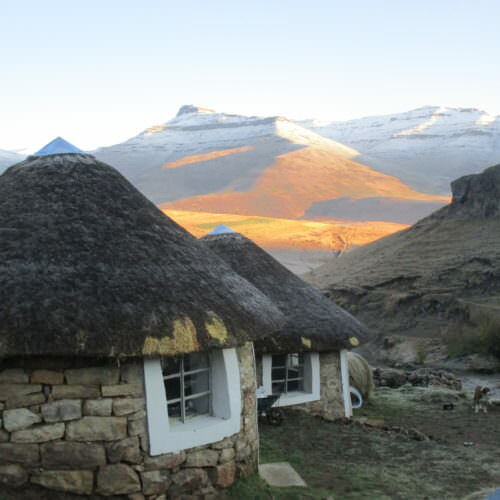 At night you stay in mountain lodges, some quite basic and simple, others really comfortable, but all have great views and the opportunity to spend time with the people who live and work in this remarkable mountain kingdom. 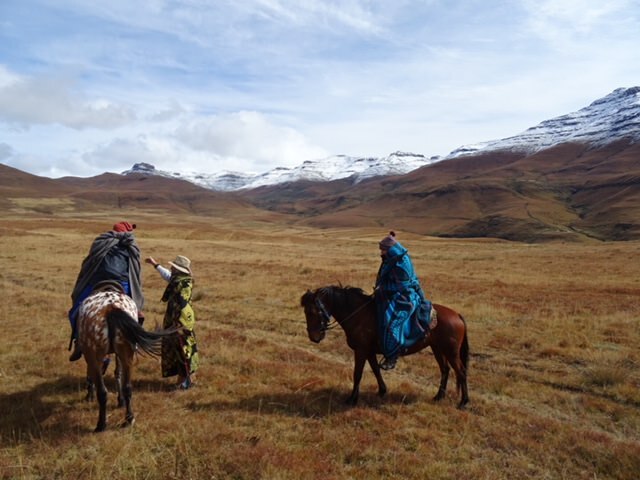 The accompanying support vehicle takes your personal luggage so you just carry with you on horseback what you need for the day. 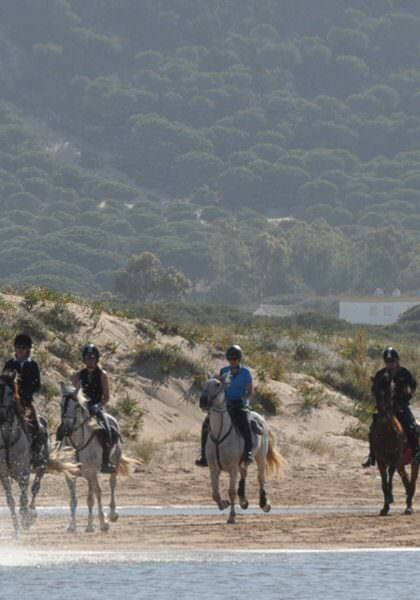 The riding is a mixed pace, mainly walk with some trots and canters. 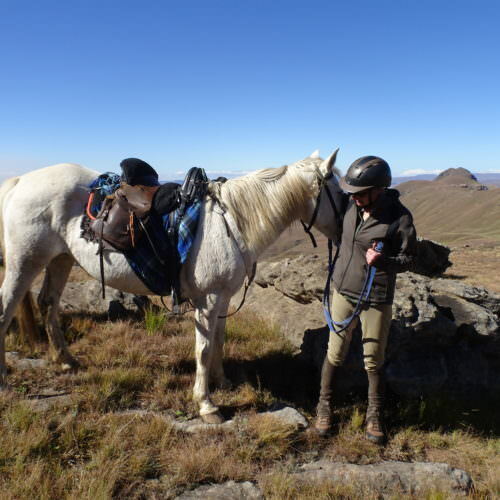 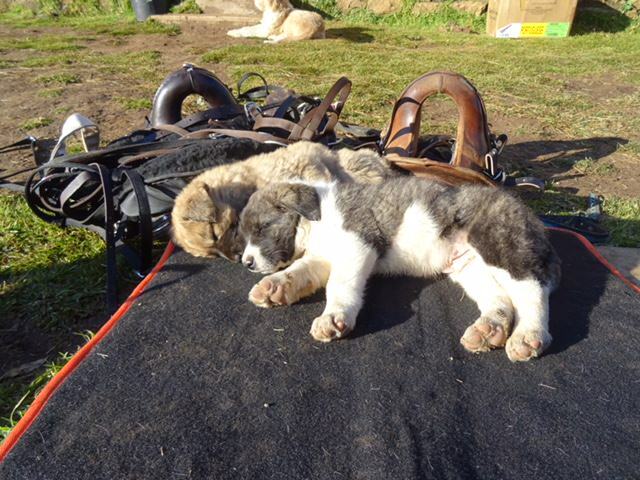 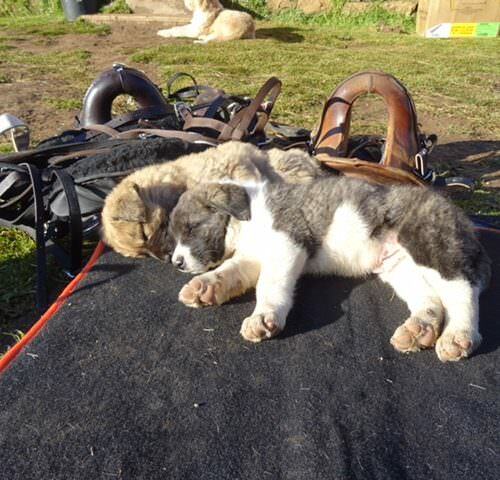 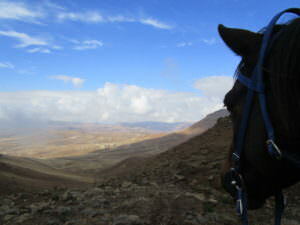 The terrain is mountainous with some long days, up to eight hours, in the saddle. 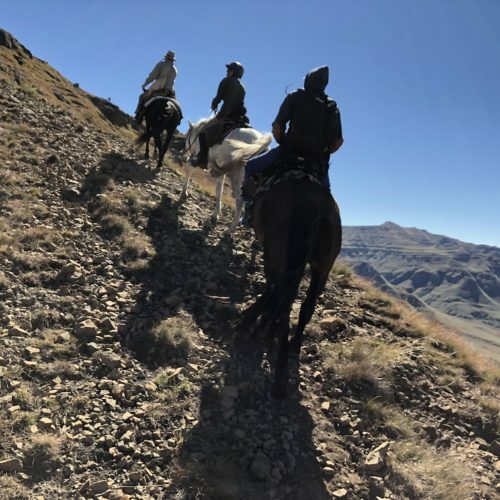 There are steep and rocky sections where it will be necessary to dismount and lead the horses; these rides are not for those who suffer from vertigo. 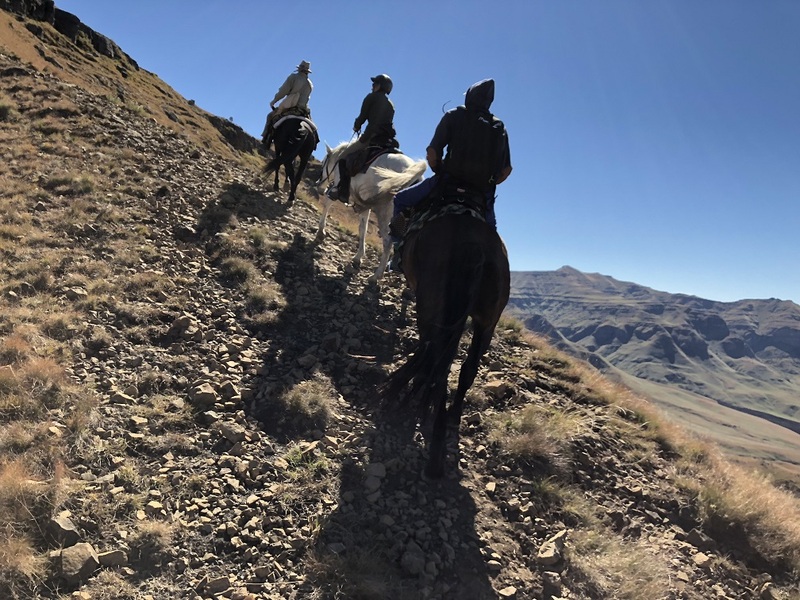 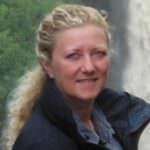 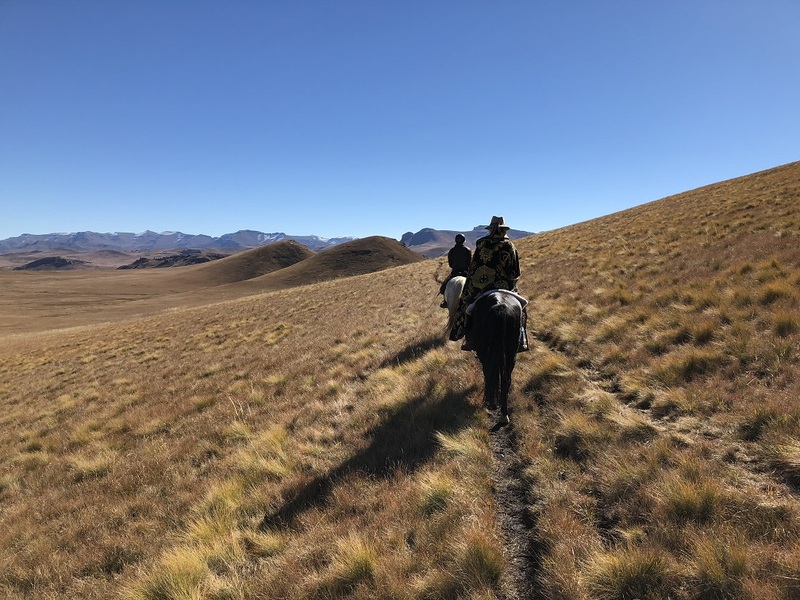 This is a physically exerting trail across challenging terrain so riders need to be fit and confident both in the saddle and on their own two feet. 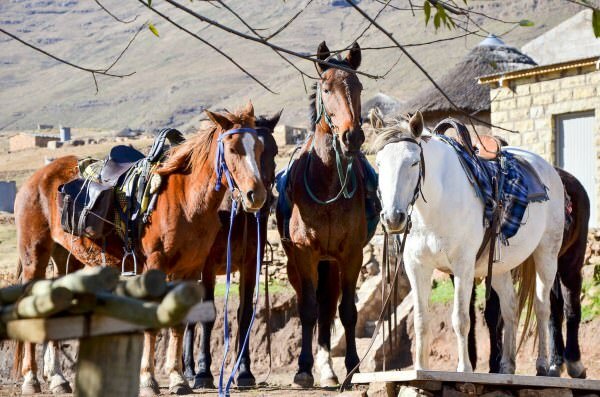 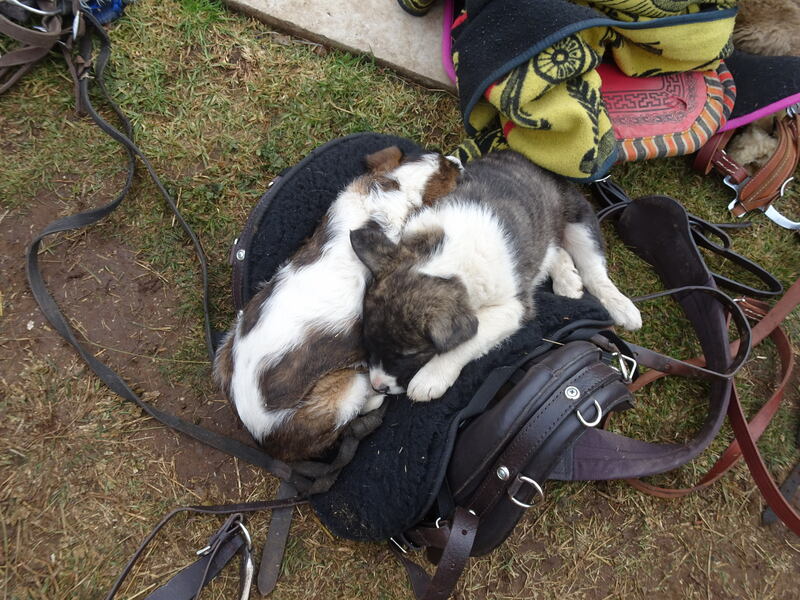 The horses are local Boerperd and Basotho ponies with an Arab blood line running through the herd. 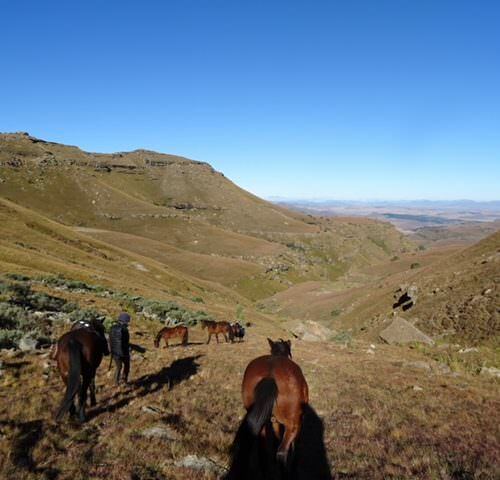 These horses range from c.14hh to 15hh, are strong and footsure, and in their element in the terrain you will be crossing. 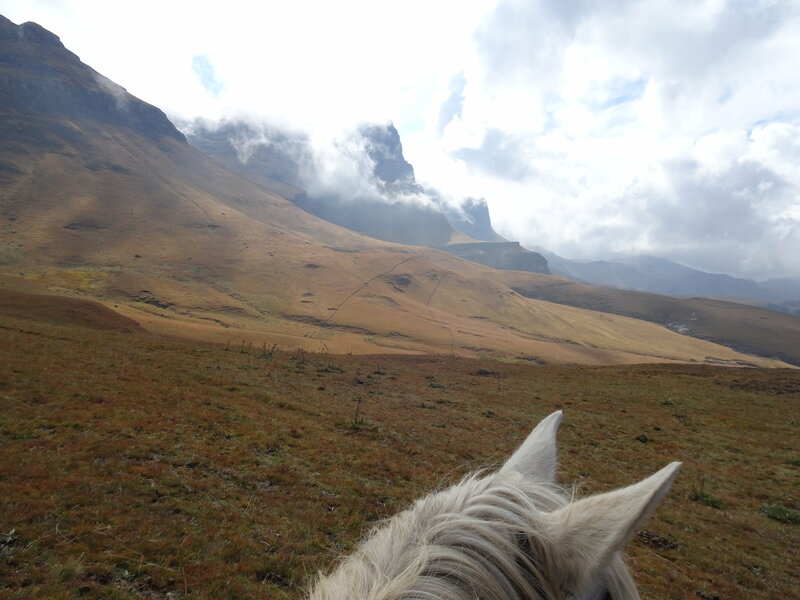 The saddles are South African trail saddles. 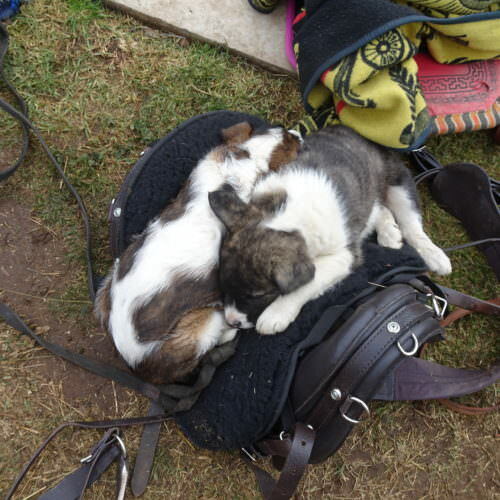 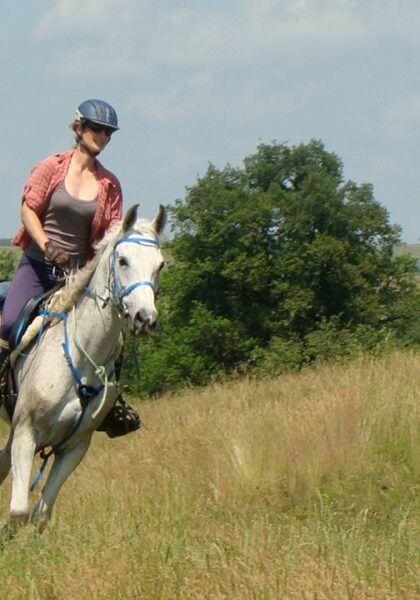 All horses are ridden in snaffle bridles on a loose rein. 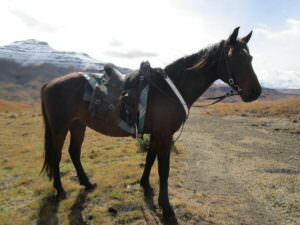 The riding style is English. 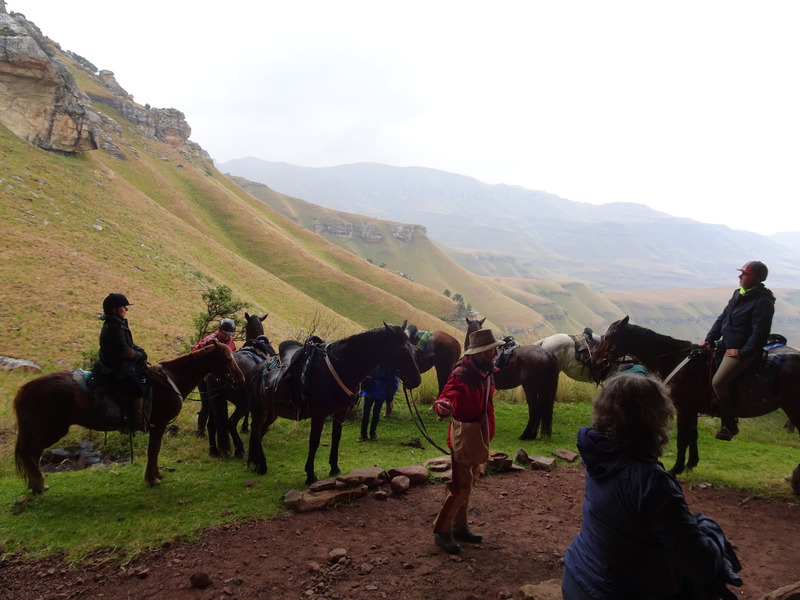 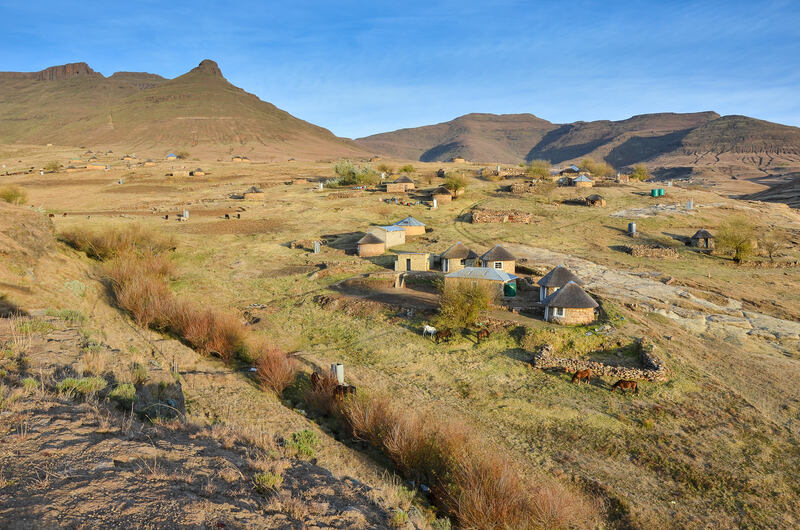 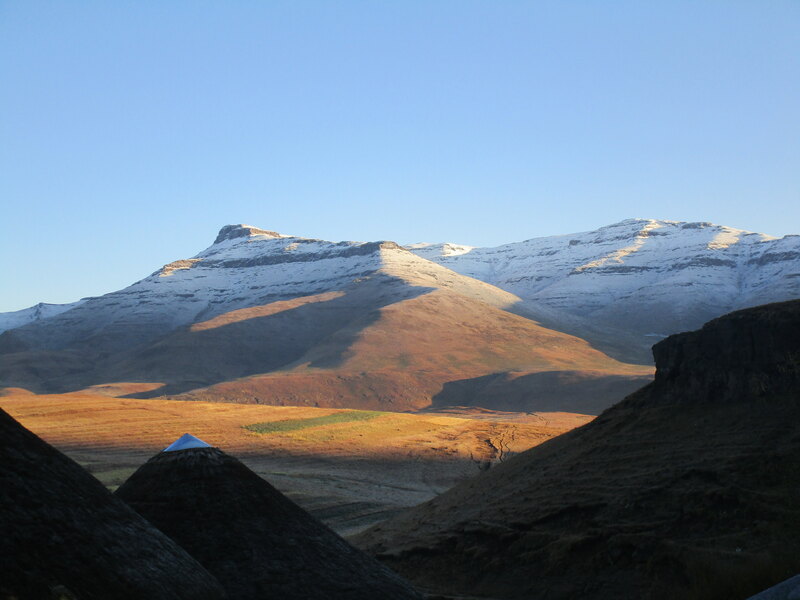 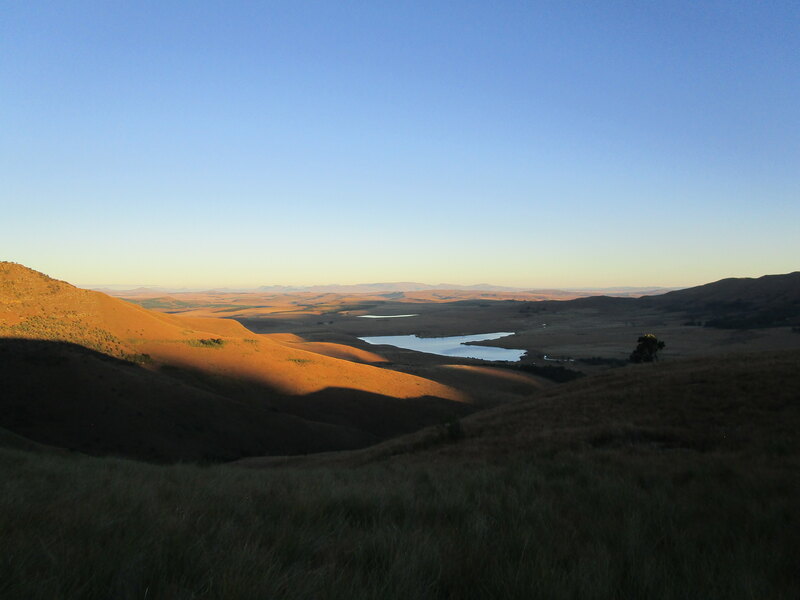 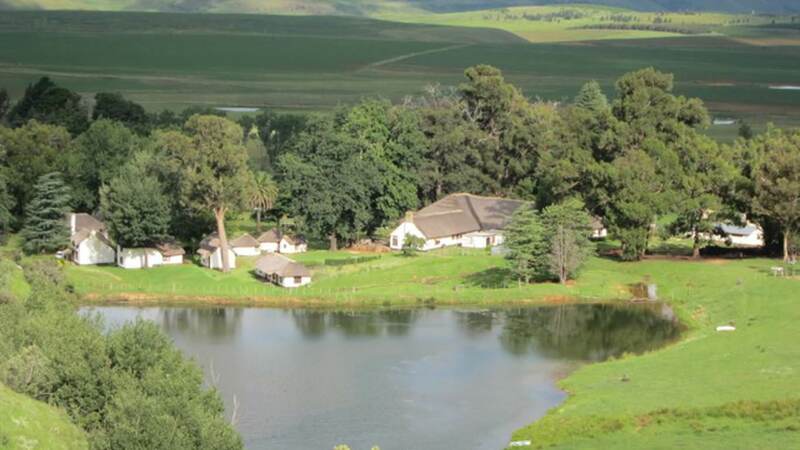 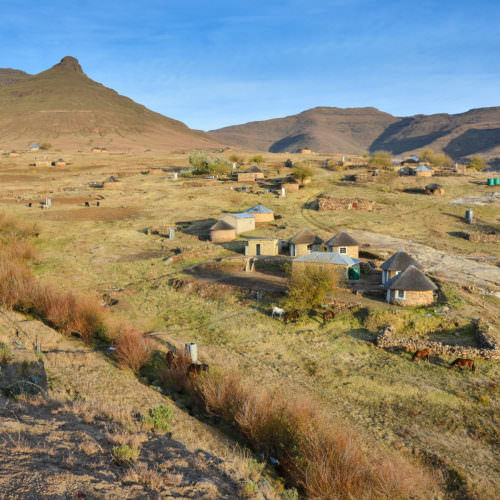 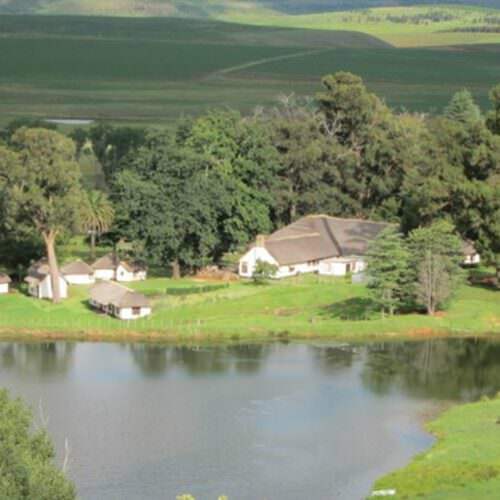 The start and end point of the ride is Khotso Lodge, based on a 1,300 hectare working horse and sheep farm, nestled in the foothills of the Drakensberg at 1,300m above sea level. 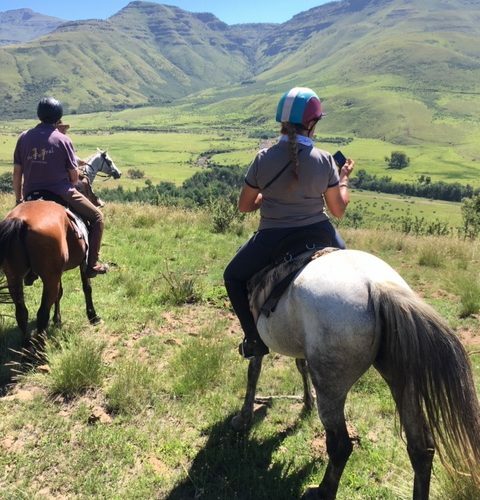 Riding guests stay in one of three rondavels comprising a double bed room, a shower and toilet, an open plan kitchen, dining and lounge area with open fire, a private outside deck overlooking the valley and a further three single beds on a mezzanine floor. 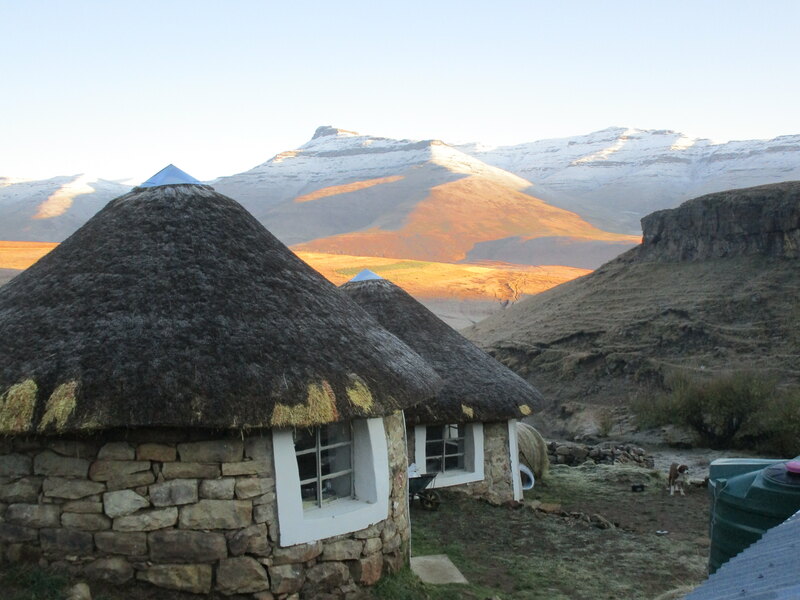 An authentic, purpose built thatched lodge in a quiet village, Thamatu Lodge is 2,600m above sea level. 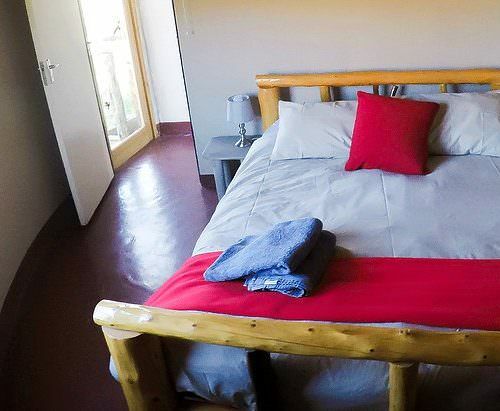 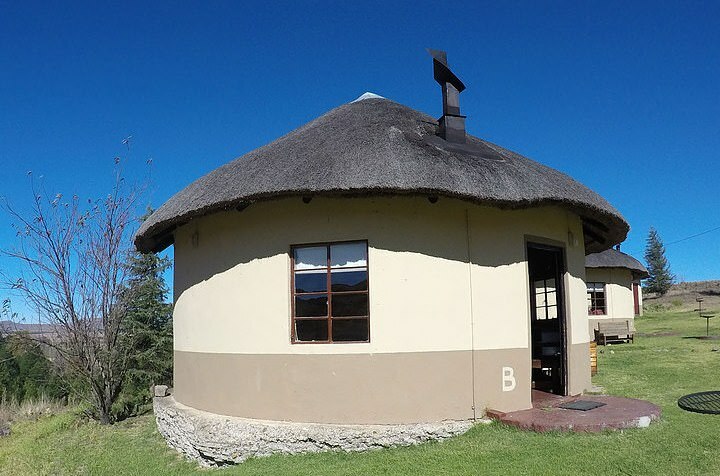 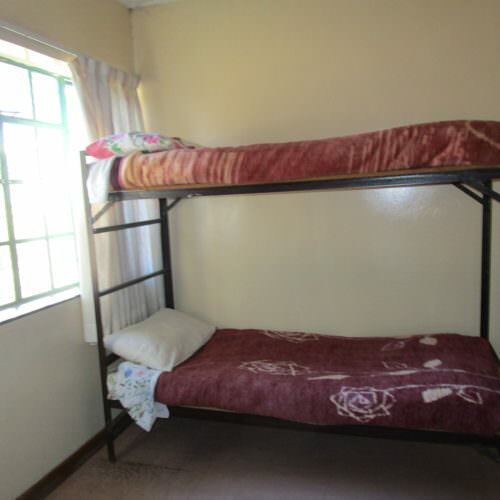 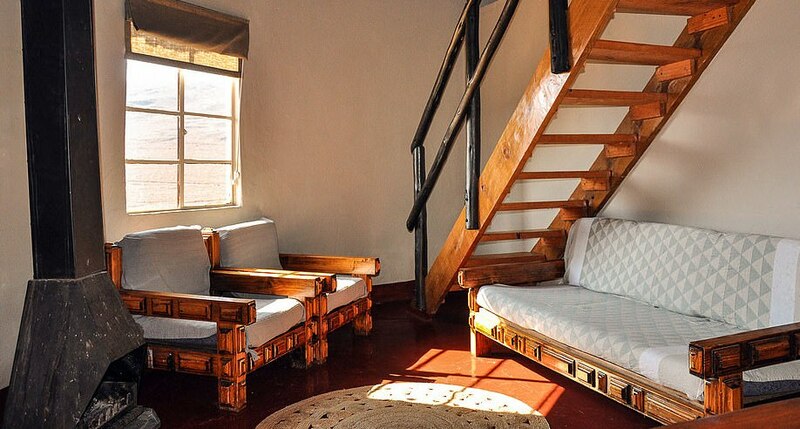 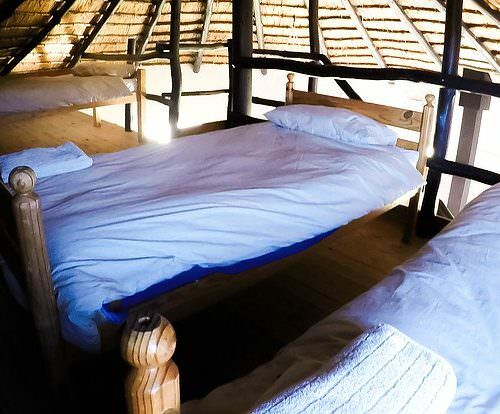 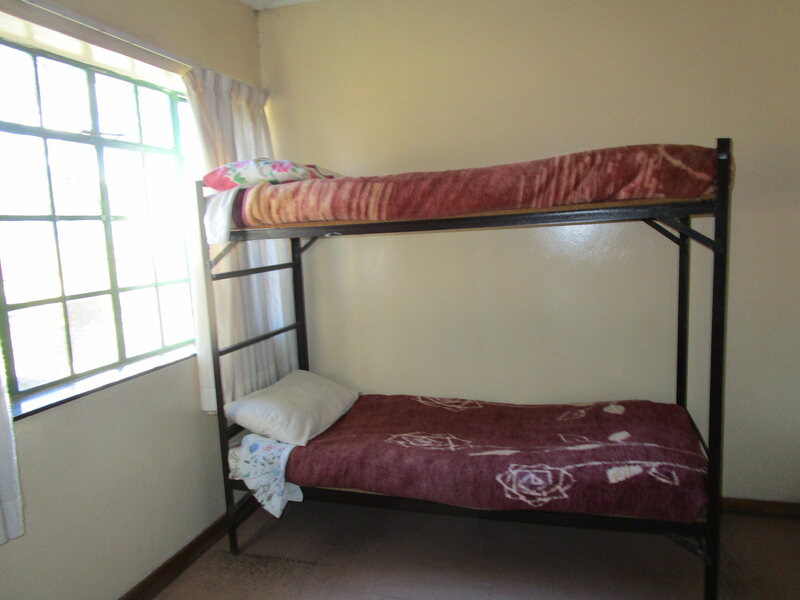 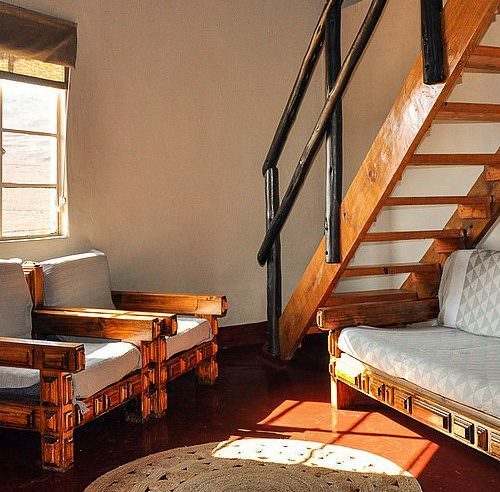 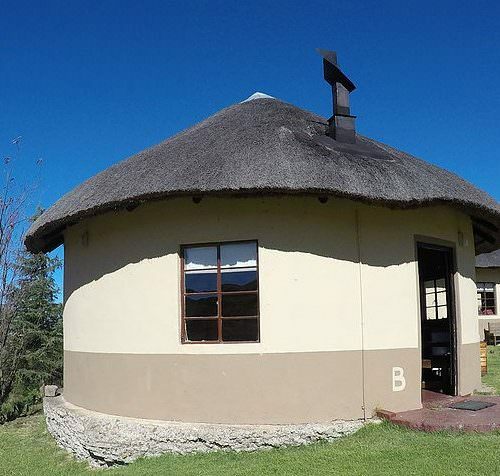 It is rustic and basic yet spacious with multiple bunkbed dorm-style rondavels with comfortable, clean and warm bedding as well as a central lounge/kitchen building with an open fire place. 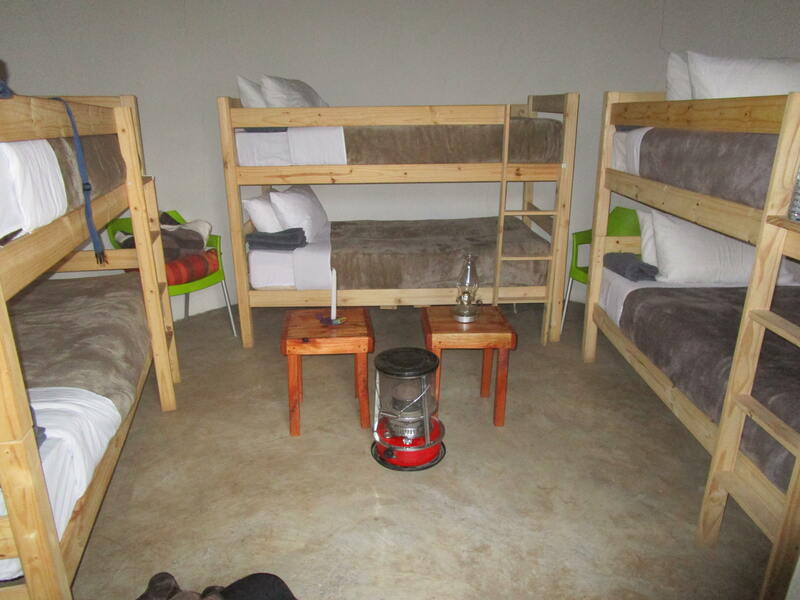 There are two showers and toilets, which are shared between the group. 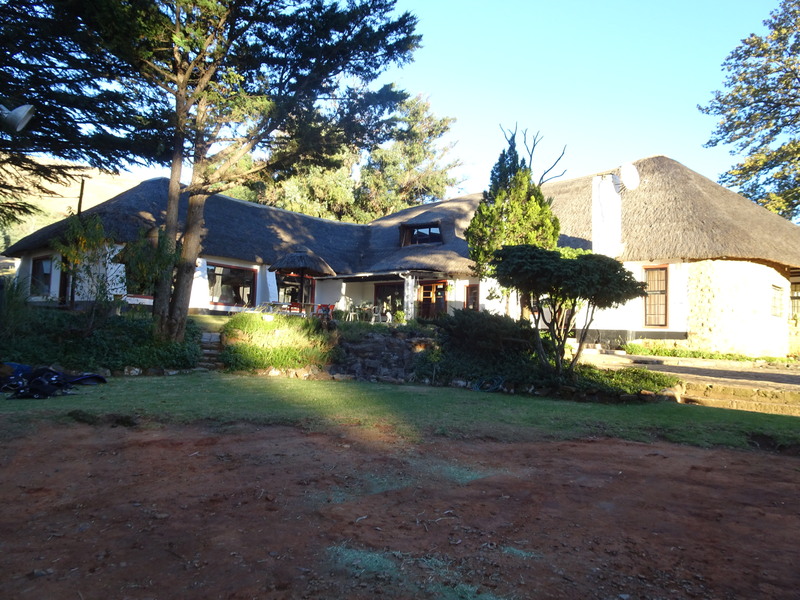 There is no electricity at the lodge. 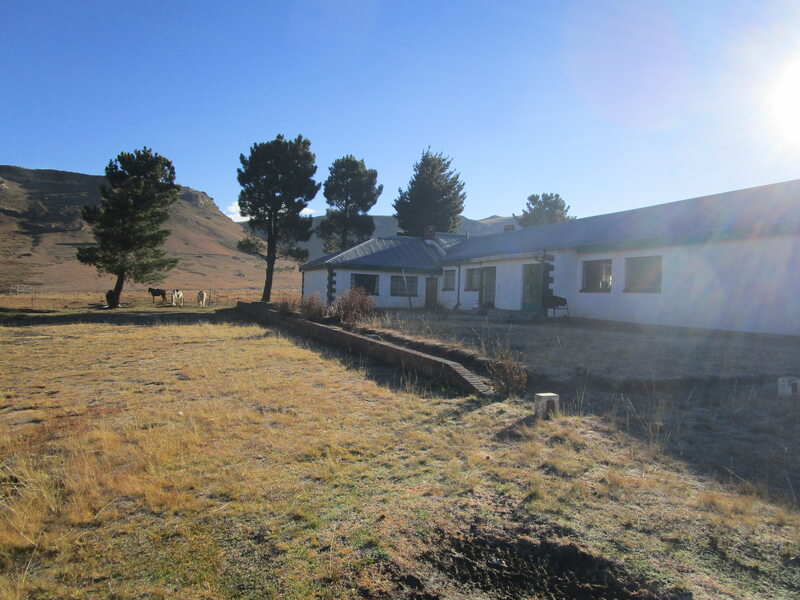 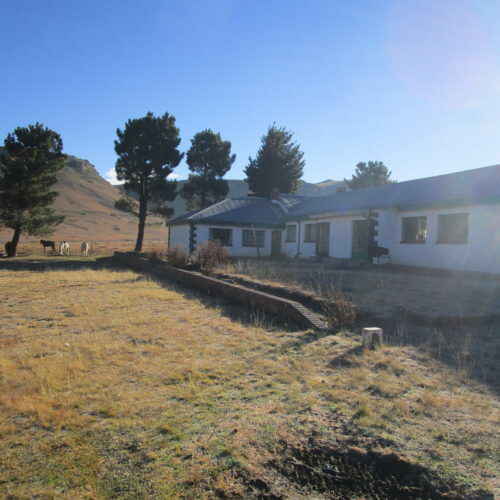 Located at Ha Semanyane, The Project (2,300m above sea level) is a former agricultural education centre. 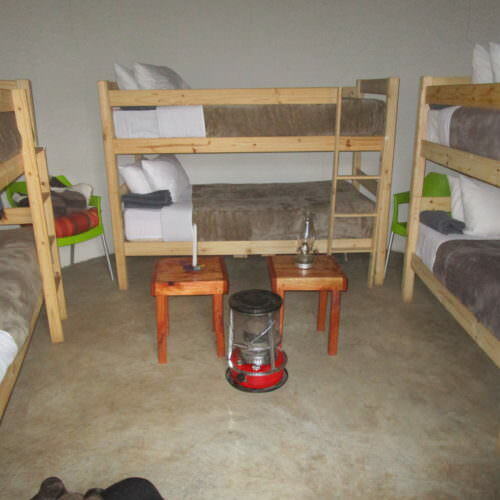 Although basic it still promises comfortable warm beds, a good atmosphere and great food. 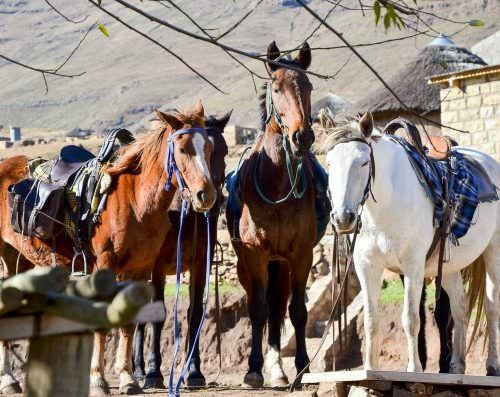 Continuing drought, combined with an ageing plumbing system, means that buckets may have to be used to flush the loos. 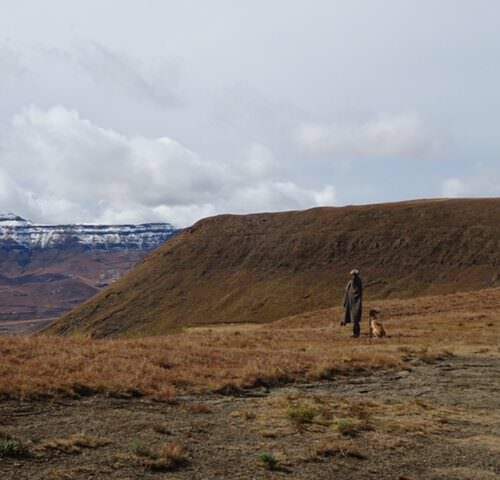 There are no showers available. 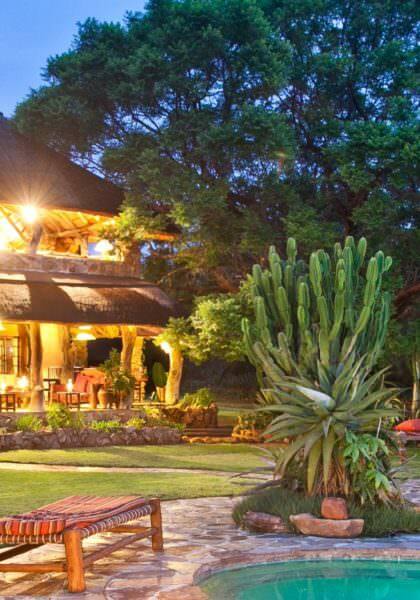 As in the rest of this area, there is no electricity, but supper by candlelight makes for a pleasant ambiance. 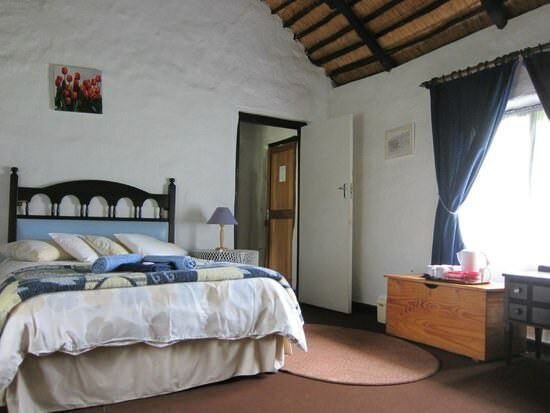 St Bernard’s Peak Hotel is a gem of a location, nestled just under the mountain at 1,800m above sea level. 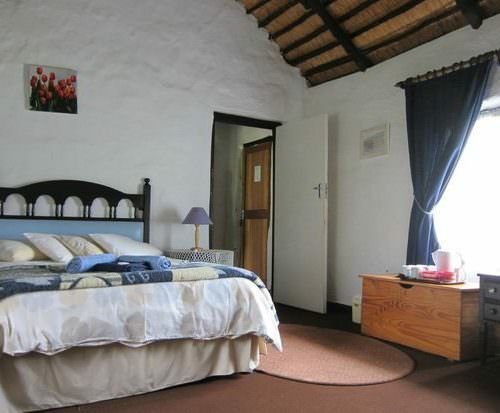 There are a number of small en-suite one or two bedroom thatched cottages, each with an open fire in the bedroom. 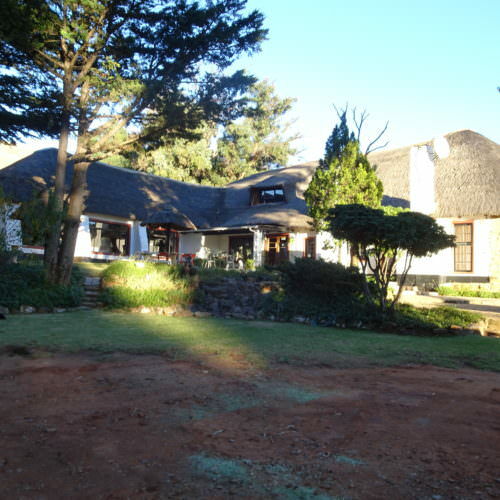 There is a pool, a well-stocked bar and great meals served in the dining room. 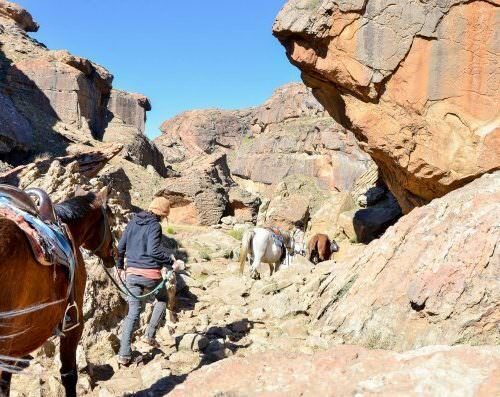 The trails need a minimum of three guests to confirm, with a small group supplement, except for February and June 2019 when the rides will confirm to run for two guests at no supplement. 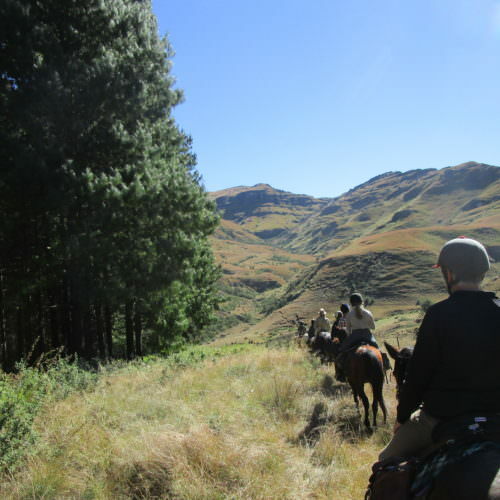 INCLUDES Accommodation; meals; riding; beer/wine with dinner. 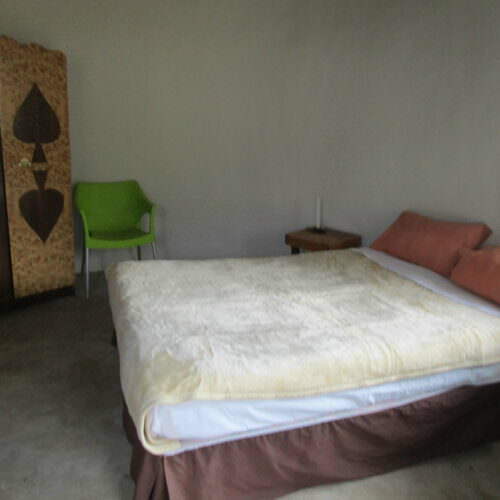 SINGLE SUPPLEMENT The accommodation in the mountains is limited and single rooms are not possible. 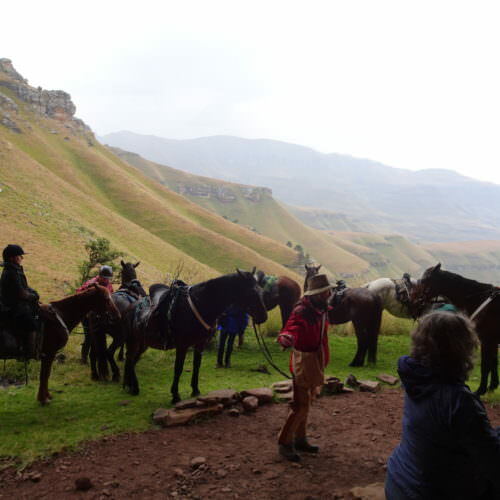 TRANSFERS The group transfer from Durban to Underberg is at 07:00. 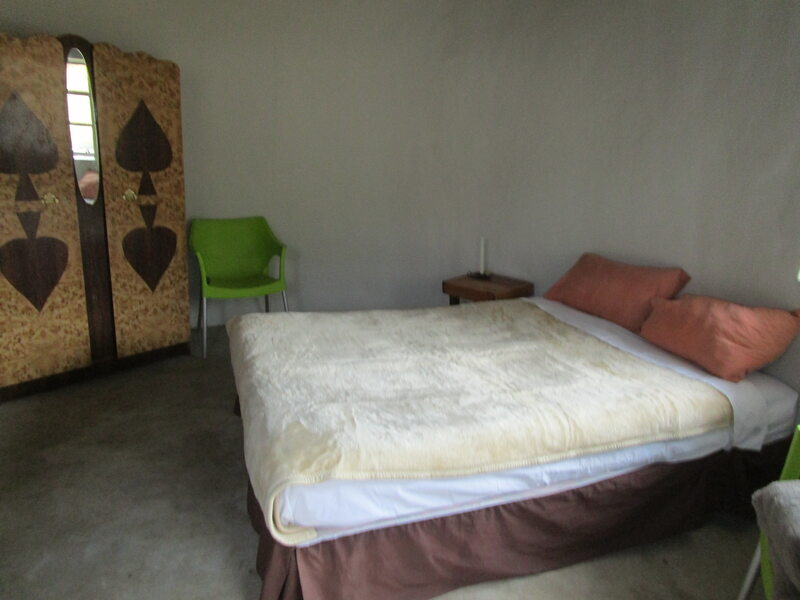 The transfer takes about three hours and costs £64.79 per person return. 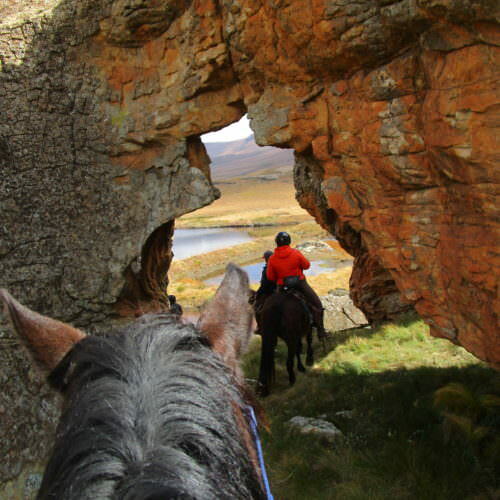 Later private transfers (before 12 noon) can be arranged for £111.71 per person return. 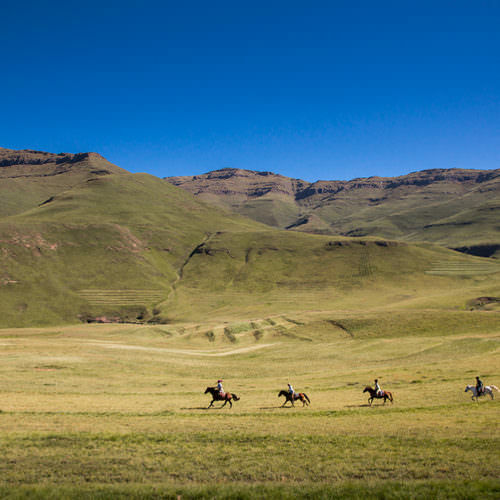 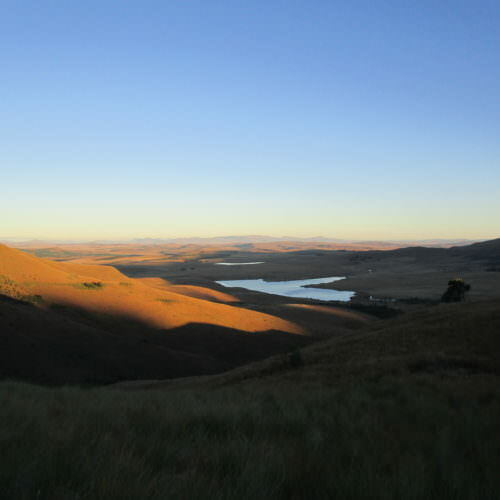 The ride starts at Underberg in South Africa about three hours west of Durban. 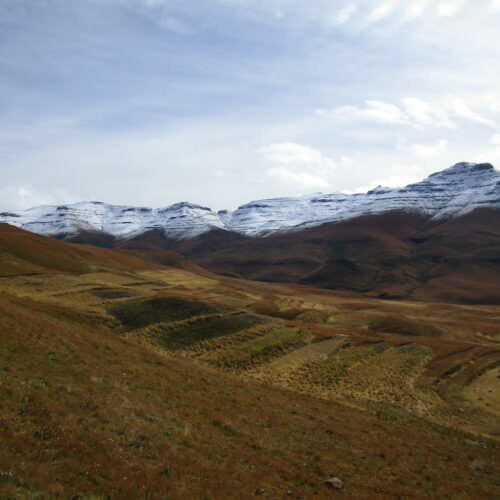 From Underberg you enter Lesotho at Bushman's Nek border pass. 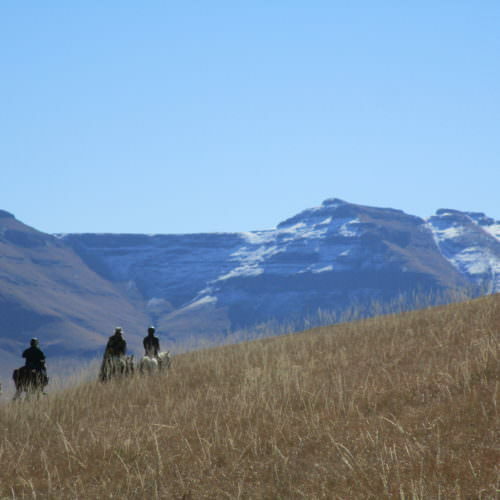 The seasons are very different but trails can take place throughout the year. 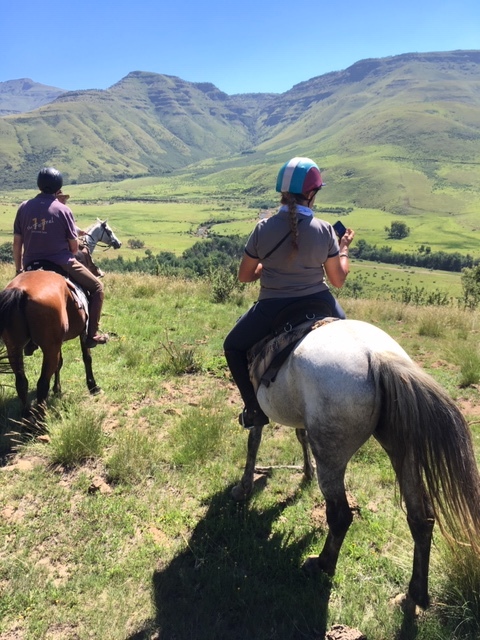 Summer (from November to March) is the wet season, and storms often mean you have to ride out earlier, but it is lush green and the mountains look spectacular, clothed in wild flowers. 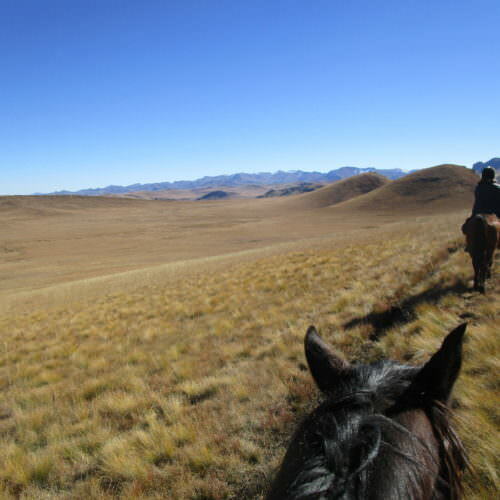 In winter, the grass has dried out and it is almost desert-like. 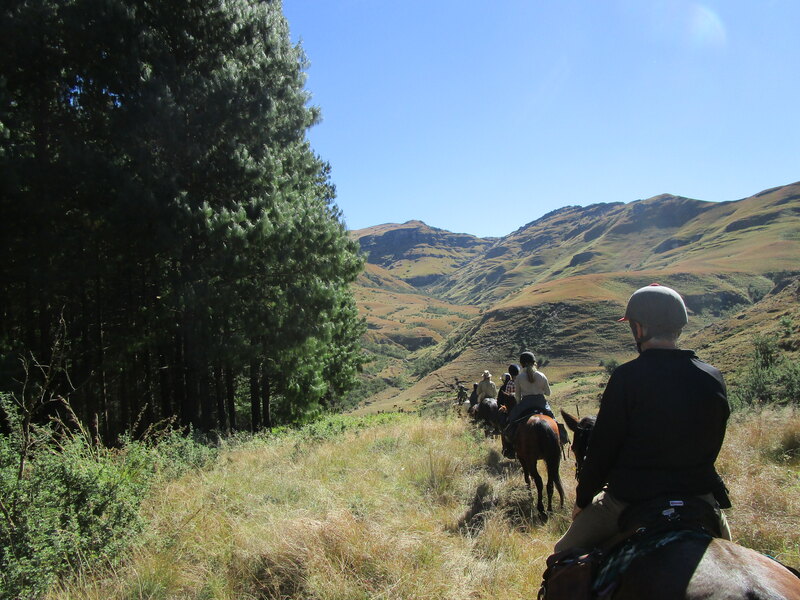 Dry, warm days perfect for riding give way to cold nights where temperatures can plummet to minus 15ºC. 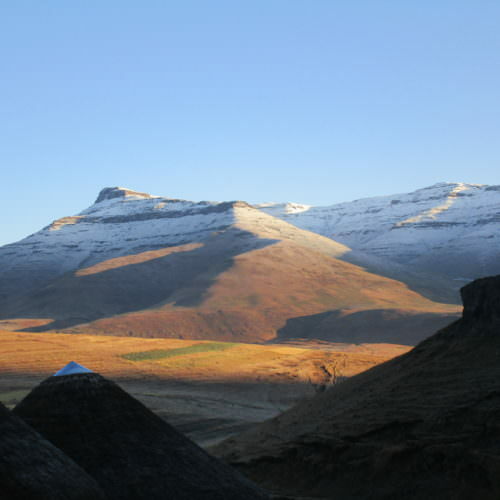 Snow is a real possibility! 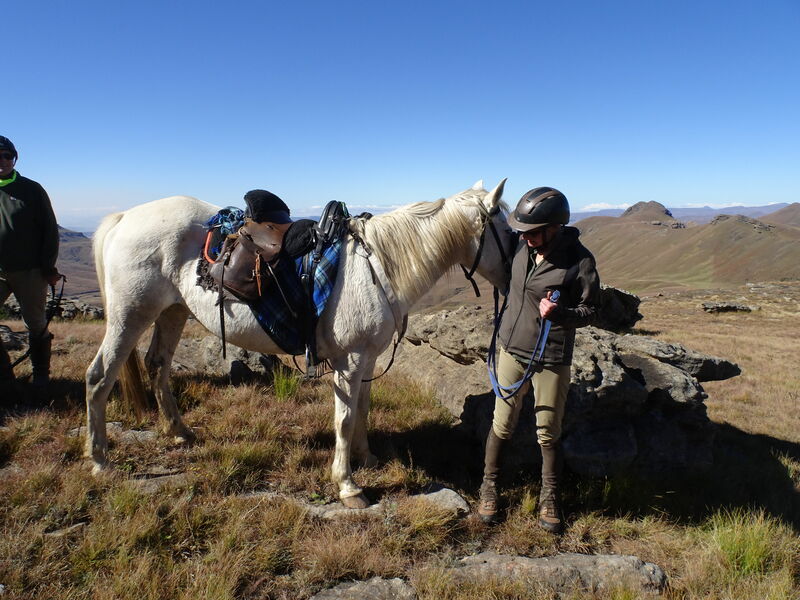 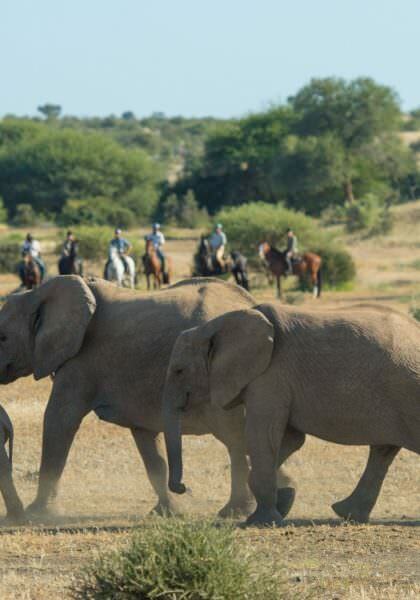 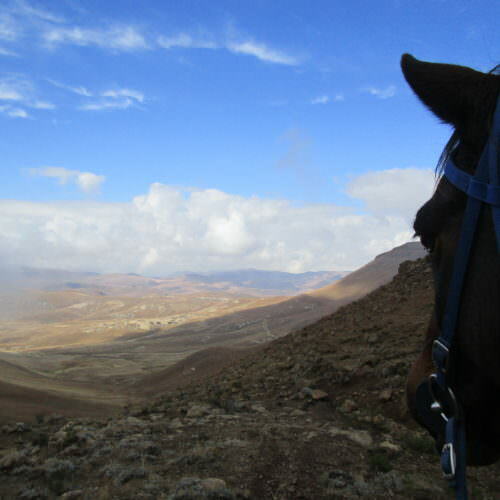 The most amazing, challenging and rewarding riding holiday you are ever likely to encounter. 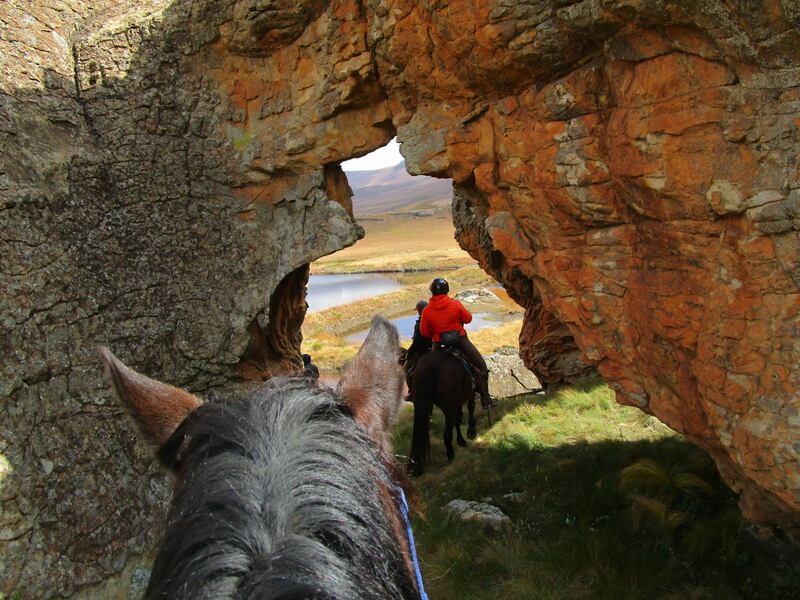 With plenty of culture mixed with adventurous riding, this is more of an expedition than a typical holiday. 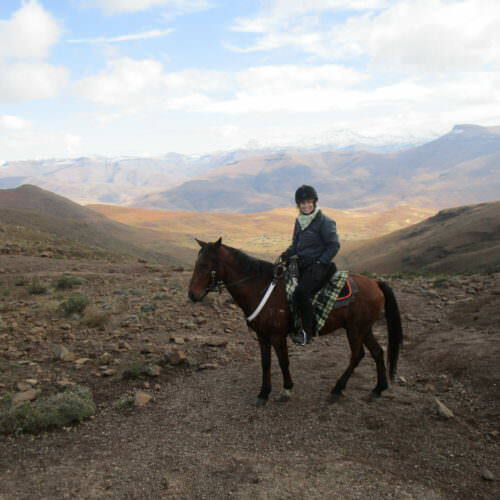 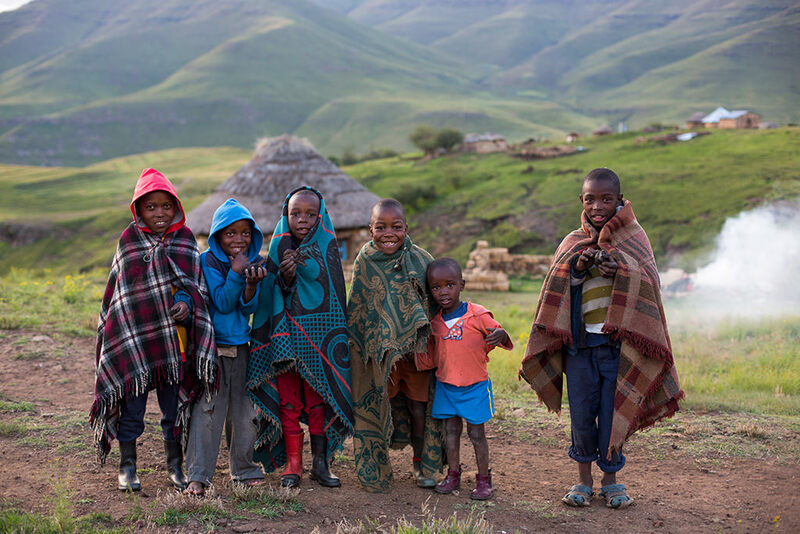 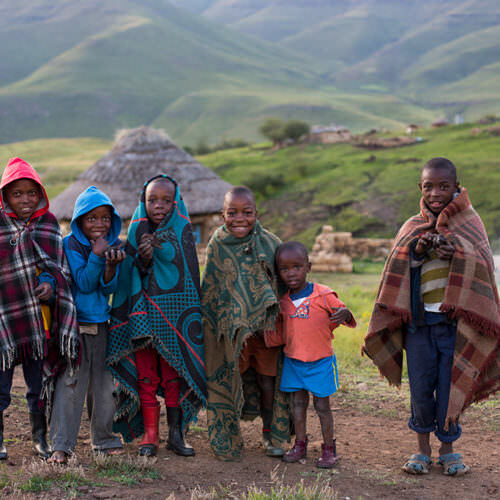 A real African mountain adventure with plenty of local culture. 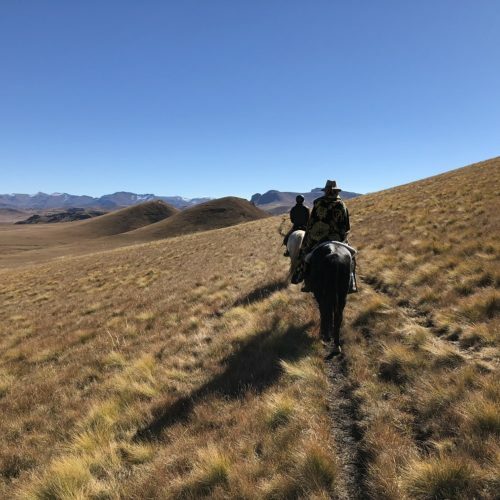 We always recommend dressing in layers but on this ride, because of the change in altitude and unpredictable mountain weather, it's really essential.